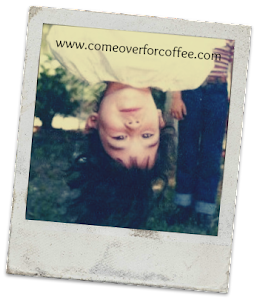 Come Over For Coffee - We'll Talk: Manners, Anyone? Good manners reflect something from inside-an innate sense of consideration for others and respect for self. Yesterday was another Open Yard. We had such a good time, and the weather was perfect. Lots of mommies and kiddos spent the day enjoying the weather and each others company. As we were talking, one mom brought up the task of teaching her children table manners. We all agreed that it is a very tough job to teach our children how to behave like humans instead of little monsters at the table. I shared the method we use at our house, and it got some really posititve feedback. So I thought I'd share it here with you. Maybe it will help someone else teach manners at their house. At our table, we play a game called Manners Money. At the beginning of the meal, everyone at the table gets the same amount of money (usually in coins). The money sits right above the plate in easy reach of the others at the table. Before the game begins, we discuss the specific infractions we are watching for - elbows on the table, talking with your mouth full, eating with your fingers, etc - and then start the meal (and the game). As the meal progresses, if anyone at the table sees someone using poor manners, they can call them on it. Sidenote - We really had to tweak this point since S2 would yell it out and point at the guilty party like they had just murdered someone. We had to teach a gentle type of accusation that used an indoor voice and no witch-hunt style pointing. If you can catch a person breaking a manners rule, you get to take their money. The first coin you lose is the one with the lowest value. From there, you lose up until all your money is gone. The person who catches you being unmannerly gets to keep your money, until they commit a faux paus of their own. At the end of the meal, you get to keep all the money at your place. One of my guys' favoritte part of this game is that DH and I play too. If they can catch us breaking a manners rule, they get our money. And we always have bigger value coins at our place to make catching us a special feat. What about you? How do you teach manners to your kids? What's the hardest etiquette rule to teach? Great idea! Great minds must think alike - we have done something very similar with mini marshmallows. (We call them "manner-mallos". We haven't done it for a while though. Thanks for the reminder! One summer I focused on the fruits of the spirit. We had an empty jar and a container of marbles (we called them "fruity pebbles") and whenever anyone caught anyone else exhibiting any one of the fruits of the spirit (love, joy, peace, patience, kindness, goodness, faithfulness, gentleness, and self-control) that person got to put a fruity pebble in the jar. When we filled up the jar we all got to go out for ice cream! It was fun, but I think it would be even more effective now that the kids are a little older. Also gives you a great opportunity to teach on each of the fruits of the spirit. I love that fruits of the spirit jar! I'm going to have to try that one. Great idea. Thanks! The way my mom taught it to me (which has to do with the quote you used at the beginning of your post) ... My mom said that "good manners" and rules on how to act at the table... were all created out of love and consideration for others. My mom always told us that acting appropriately had to do with caring about others... she said this because I became so obsessed with how people chew (I got very sensitive ears) that she said I forgot the purpose of manners... and that "picking on people" who didn't exactly act accordingly to the way I wanted or felt was best was ALSO bad manners and actually the opposite of "showing love to others" ... interesting... isn't it? Great post! Great reminder! Thank you, Paloma. I'll have to use that line. Great idea! I like the Fruits of the Spirit Jar Susan commented about, too! Thanks for sharing! That was a good idea. Wish I could take credit for it :-) I'm thinking on how to put it into action here. I can relate to this post very much with our boys (we have two boys: 9 & 7 and one girl: 4)! Fun to see you on here! It's amazing how much money I've managed to make (and give away) at the dinner table. Thanks for stopping by! Have a great summer.